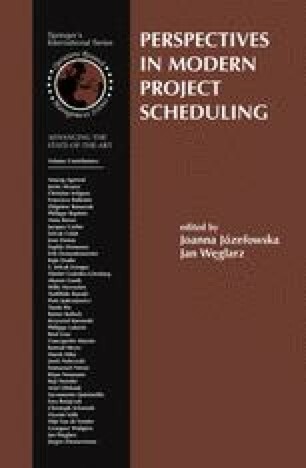 We introduce a generalized model of the resource constrained project scheduling problem (RCPSP). It features that (i) the duration of an activity is not constant, but can vary in a specified range, and (ii) the objective is to minimize a convex function of time-lag costs, where a time-lag cost is charged according to the difference between the start/completion times of activities. These features achieve the flexibility of the model. It is known that, in the RCPSP, resource constraints can be replaced by some precedence constraints appropriately defined between the activities that require a common scarce resource. If we remove resource constraints by precedence constraints, our problem can be formulated as the dual problem of a minimum cost flow problem, and thus can be solved efficiently. Exploiting this property, we design a heuristic algorithm based on local search. We conducted computational experiments with benchmark instances to minimize the weighted earliness-tardiness costs, as well as instances in which activity-crashing or relaxation of temporal constraints are allowed. These results indicate the usefulness of our generalized RCPSP model and the proposed algorithm.